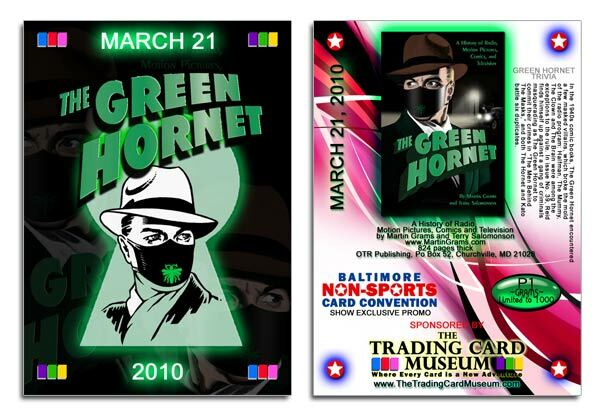 HERSHEY, Pa – USA Theatres, organizers of the up-coming Baltimore Non-Sports Card Convention, recently revealed a limited edition Green Hornet promo card, designed exclusively for the convention, in conjunction with Martin Grams’ and Terry Salomonsons’ up-coming Green Hornet book due for publication March 2010. The card will be issued with each paid admission, while supplies last (only 1,000 will be printed). The convention will feature numerous tables of exhibitors from the non-sports hobby, including artists, authors, manufacturers, publishers, and dealers. Newly added guests appearing at the convention include Brian Kong (a full-time sketch card artist, who has created over 10,000 original sketch cards from some of the most prolific properties including MLB, X-Men, Star Wars, Indiana Jones, Heroes, NBA, Dexter, Marvel Masterpieces, Iron Man Movie, Lord of the Rings, Spiderman 3, Star Trek, Marilyn Monroe, Wizard of Oz, The Complete Avengers, DC: Legacy, and Frankenstein) and Manny Mederos (cartoonist/Illustrator and sketch card artist, whose recent projects include sketch card sets such as Voltron, Defender of the Universe, Moonstone Comics Maximum, 5finite’s Zombies VS Cheerleaders, and the Archie Comics/March of Dimes sketch card series). “It is a great honor to host such extraordinary talent,” said Ronald M. Vastola, Outreach Coordinator of USA Theatres. Other highlights of the convention will include a unique exhibition by Geppi’s Entertainment Museum and trading card manufacturer Rittenhouse Archives. The convention is set to debut’ on March 21, 2010 from 10 a.m to 3 p.m. at the Towson Place Hotel & Suites (Formerly the Holiday Inn Baltimore-Towson), 1100 Cromwell Bridge Road, Towson, Maryland. Admission into the event is $5 for adults, and free admission for children under 12.